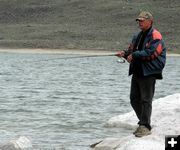 Snow, rain and cold, along with reports of low water and low fish levels, combined to keep turn out low on opening day at Soda Lake, May 10th. But the diehard fishermen were rewarded with a small, but active, fish population. 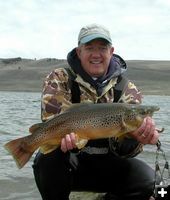 Bill (Rock Springs) has made 19 of the last 20 opening days at Soda Lake. By the string of fish tied to his float tube, and a 6-7 lb big brown, he appears to know what he is doing. Tyson (Green River) slept in his truck last night to be ready this morning. When the fish were not hitting flies from his float tube, he borrowed a spinner rod from Dan (Green River), whom he did not know before today, and fished from the shore. His reward was a 5 lb female brown that is "going on the wall". A dozen campers, a handful of boats, a few float tubes, and maybe 40 fishermen is a far cry from the normal opening day at Soda Lake. Tony (Green River) remembers the year not too long ago when he counted 100 boats and tubes on the lake at one time. Larry (Green River) remembers years having to be careful every cast not to hit anyone. 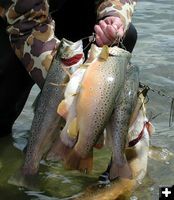 Population estimates are as low as 2000 fish now, down from as much as 46,000 in 1997, but they are biting on opening day. 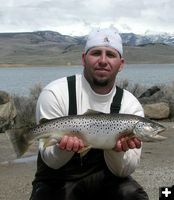 Tony (Green River) speculates they may be biting because they haven’t seen a lure all winter. Mandy (Game and Fish) has been doing creel counts all morning and only encountered one fisherman without fish. By early afternoon a few fisherman had caught their limit and gone home. 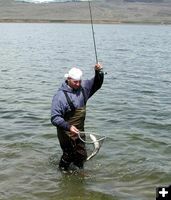 But it is clear the rewards at Soda Lake are not just fish. While Tony (Green River) picks the bones of the fish he caught this morning and throws scraps to a camp gopher, he figures that anyone who stays away because there are no fish probably shouldn't be there anyway. He said, "as long as the osprey are catching fish, we are doing just fine". Mandy (Game and Fish) woke up this morning to 16 deer grazing around her trailer. Larry (Green River) arrived in the early afternoon and wanted to get a hook in the water, but was really waiting for Thursday when the grandkids get out of school so he could pick them up. "They will love this sand," he said, pointing to the beach where his dog Bronco was already exploring. 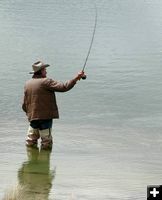 Fishing is the excuse, but these opening-day fishermen from Utah, Idaho and all over southwestern Wyoming, have found something more at Soda Lake. Tyson's Big Brown 5 lb female brown caught from shore with a lure. Tony's Camping Spot Tony arrived on Friday to secure "his" camping spot.